2) The Quadra-Trac II or Quadra Drive II 4WD system; meaning you have the NV245 two speed transfer case with the ability to drop down into 4-LOW. 3) At least 3.73 gearing or higher in the rear end - this is the one factor that most people are not aware of and often overlook. 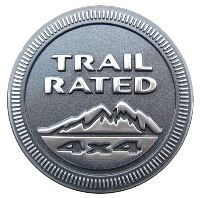 You have to have some combination of all 3 things I mentioned above to get Chrysler/Jeep's Trail-Rated designation/emblem from the factory. Last edited by Big Blue; 03-19-2019 at 05:36 PM. You have to have some combination of the 3 things I mentioned above to get Chrysler/Jeep's Trail-Rated designation/emblem from the factory. Some combination, such as 1 + 2? Mines a Hemi 5.7l with QDII. Not sure on gearing or even how to figure that out. Ignore me, didn't realise it was different in the US / UK. Last edited by Big Blue; 03-19-2019 at 06:00 PM. Thanks, those don't seem to work for UK models. Awesome, I'm glad I could help you find the answer. So, I actually went back to the first link and had to poke around until I found the right path to get to the factory build sheet option, at which point, I reposted the link that actually worked for you. Now I have to update it in the New Member's Required Reading Sticky thread. Last edited by Big Blue; 03-19-2019 at 07:53 PM. So from what I can find, 2010 Commanders that came from the factory with the 18" wheels did not get the Trail rated badge. Exact same spec'ed Commander with 17" wheels did. Just an observation, not hard facts. I compared build sheets of 2010 commanders from Autotrader. My Commander has a trail rated badge but it's not listed on the build sheet. My specs, 5.7L V8, QD-II, 3.73 gears. Incomplete build sheet or aftermarket badge, doesn't matter now, it's is trail ready even if not officially rated. That's a trail-rated XK all day long. I know during the 2010 model year, Jeep did a few subtle things different; it could just be that they stopped listing trail-rated on the build sheet. Last edited by Big Blue; 03-20-2019 at 12:53 PM. I saw a Jeep Commander the other day and it was 4x4 and everything. Then I noticed it did not have the trail rated badge and wanted to know what makes some commander 4x4s trail rated and others not? A sticker. Without that sticker you are taking your life and jeep into your own hands and Jeep will not be held responsible .